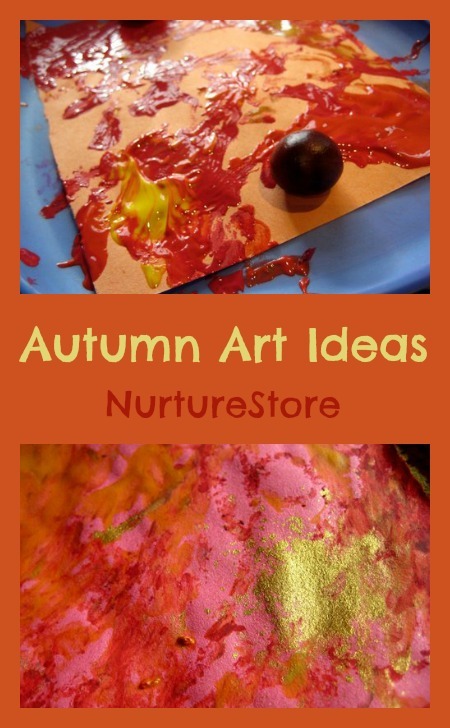 Here’s a fun autumn painting idea: ever tried making roly-poly pictures with acorns and horse chestnuts? Our art this week was inspired by a question from Jo , who tweeted me asking for suggestions for acorn crafts for her Woodcraft Folk group. The idea of painting with them popped into my mind. We’ve tried this before with marbles – but why not give it an autumn spin and use conkers or acorns instead? Jo tried this with her two- and three-year olds and they loved it – and so did we! 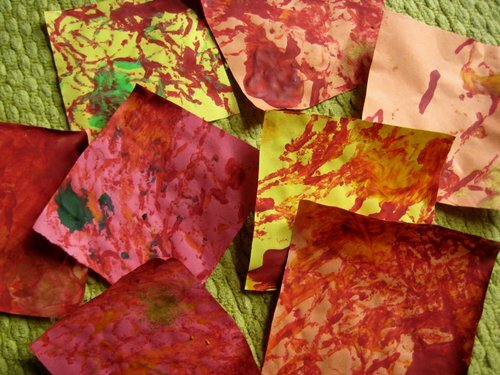 You can do this two ways: by giving each child their own piece of paper to make their own individual masterpiece, or by using a huge piece of paper and having a group work together as a team project. Either way, it’s a good idea to place your paper in something which has some edges to catch the conkers as they roll around – you could try a plate, baking tin, lid from a box, or even an old paddling pool. This bit isn’t essential and if your kids love getting messy they could sit around the paper and catch the conkers in their hands and roll them to each other. It depends how messy you want this to be! 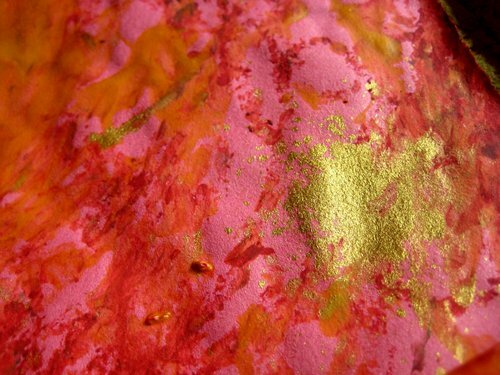 Place blobs of paint around your paper – we used autumnal colours of red, orange, yellow and gold. Add the conkers and acorns and get rolling. As they’re not a perfect sphere the conkers won’t roll as smoothly as marbles but you can jiggle and shake to get them moving. Love this Cathy! I have something similar to this planned to do with Henry! 😀 Great minds think alike! 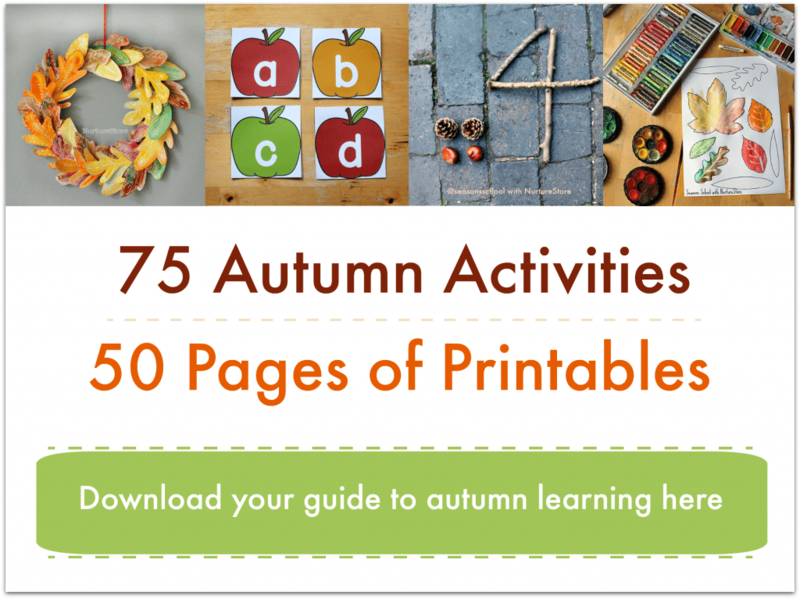 Oooh what a very fun idea… so seasonal, especially when you pick those autumnal colours! Love it! What a great twist! That’s a great idea. Thank you for sharing! 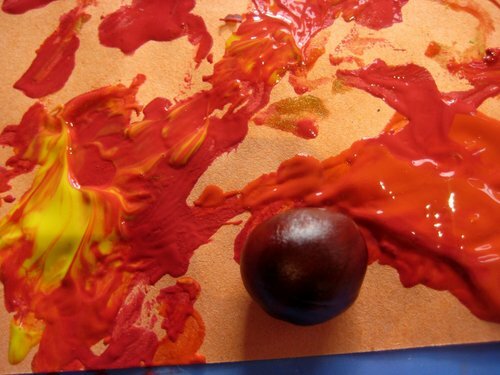 Just yesterday I was thinking if we could do some painting with the chestnuts. These look lovely,well done!